Leather has been available to the earliest of mankind and one of the most important materials used for clothing, footware, containers, shelter, harnesses, weapons etc. For nomatic, herding Turkic people in the harsh environment of Asian steppes with cold blowing winds, leather has been the material of survival. The fact that the word for leather "deri" in modern Turkish, "teri" in old Turkish comes from the word "tirik", the tax paid to the Turkish ruler, "hakan", indicates that even taxes were paid in leather and fur. 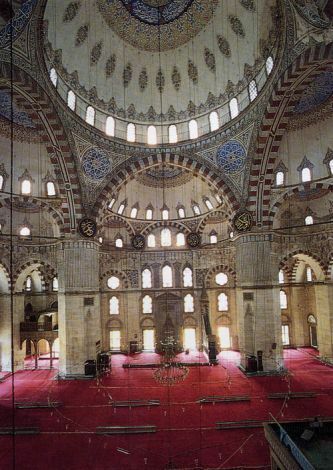 Leather and leather works continued to be an important industry for Seljuks, Ottomans and modern Turkey. Some exaples from leather handiwork are provided below. Reference: Necdet Sakaroglu and Nuri Akbayar, "Derinin Oykusu", Creative Yayincilik, 2002. You can visit the TCF Who's Who website to read leather makers' and artists' profiles.